Whether Education, is of great value, yet Sports is one inalienable and integral conjunction in the scheme of modern education. It plays an all important role in building up the personality of a student. The DAV legitimately feel proud of providing different National Teams with playing and participating members of International standards. Continuous effort, despite countless falls, in itself implies the power to rise. We have been preparing the young sportsmen for National teams despite lack of basic facilities. To be up and doing unmindful of the odds & obstacles, has always been the motto behind our astounding achievements in all fields of sports. Various, games for which College is having excellent and international level teams are Cricket, Chess, Boxing , Best physique , Power-Lifting . CRICKET :- The college is having excellent cricket team. The college is proud of having such a team. In cricket our team won the tournament held in Nawanshehar. first time participated in Inter-college and have excellent results. BOXING :- Our college has a glorious boxing team.This team won overall third trophy in Inter-college competition. POWER- LIFTING :- This sport is newly introduced at University level but our teams are doing well in this feild also. BEST-PHYSIQUE :- Our young and agile shutlers strained every nerve and flexed every muscle to improve upon their performance every year. 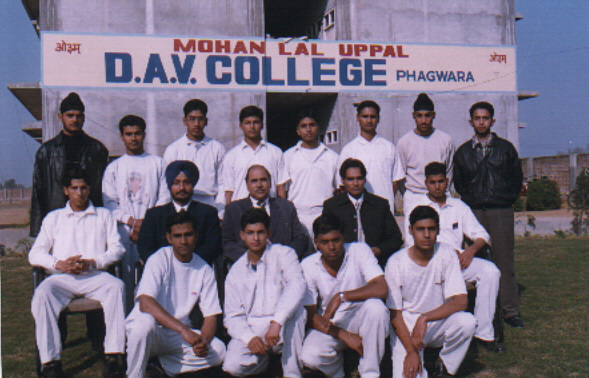 Members of the College Cricket Team.